You see Emma Davis had attended Camp Nightingale fifteen years before and the unthinkable happened during her summer at camp, her three bunk mates disappeared never to be found again. During the last fifteen years Emma has struggled to cope with the girls going missing somewhat blaming herself for what happened. Now the camp is reopening and the owner has invited Emma back to come work with the next generation of campers. At first Emma is hesitant to return but when she thinks about it this will be the perfect opportunity for her to look into the disappearance of her friends all those years ago and get some closure on what had happened. What a thrilling ride this one was! The story is told by switching past and present to blend in beautifully letting readers get to know what happened then as Emma investigates now. As the book goes on lines are blurred and the intensity goes up a notch giving readers two mysteries to solve and boy oh boy did the twists come to keep on on their toes. This was my first book by Mr. Sager but it certainly won’t be the last. 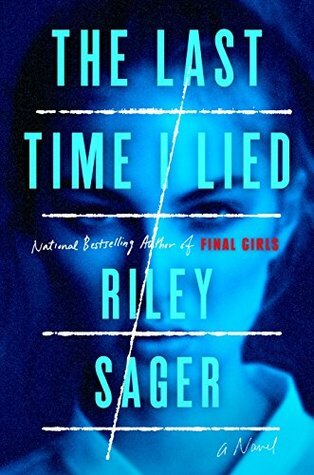 The Last Time I Lied is the second thriller from RILEY SAGER, a pseudonym for an author who has previously published under another name. Riley is a native of Pennsylvania, a writer, editor, and graphic designer who lives in Princeton, New Jersey. Oh wow, the setting sure is spooky. I love such settings in movies like Friday the 13th. Glad to hear that it worked out great in this story too.Adding this one to my TBR. Great review! This sounds like one that would keep you awake if you read it before going to bed. Great review Carrie.